I am an Engineer, in my profession I take depe pride. To it I owe solemn obligations. Since the Stone Age, human progress has been spurred by the engineering genius. Engineers have made usable Nature’s vast resources of material and energy for Mankind’s benefit. Engineers have vitalized and turned to practival use the principles of science and the means of technology. Were it not for this heritage of accumulated experience, my efforts would be feeble. 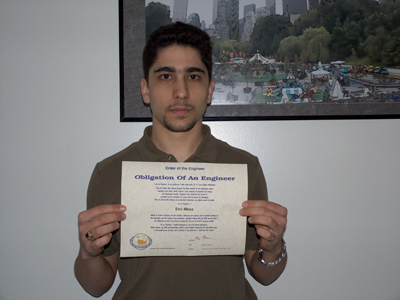 As an Engineer, I Eric Mesa, pledge to practive integrity and fiar dealding, tolerance and respect, and to uphold devotion to the standards and the dignity of my profession, conscious always that my skill carries with it the obligation to serve humanity by making the best use of Earth’s precious wealth. As an Engineer, in humility and with the need for Divine guidance, I shall participage in none by honest enterprises. When needed, my skills and knowledge shall be given without reservation for public good. In the performance of duty and in fidelity to my profession, I shall give the utmost. What resonated with me the most out of this obligation is probably different from what will resonate in the future, although the same may ring true then. Since I am currently immersed in the free software movement, I find the last paragraph, when speaking about using skills and knowledge for the public good, to be very compatible with this movement. If I can develop a software product which will vastly improve the public good, then it is my obligation to offer this software for free that others may also benefit from my knowledge and skills. By making my knowledge open and freely available to all, I add to the public good. When I hoard my knowledge I subtract from the public good. I would like to end this post with the quote from President Hoover about engineers which I found quite delightful. Just remember that in his time, Engineer mainly meant what we could consider today a Civil Engineer. It is a great profession. There is the satisfaction of watching a figment of the imagination emerge through the aid of science to a plan on paper. Then it moves to realization in stone or metal or energy. Then it brings jobs and homes to men. Then it elevates the standards of living and adds to the comforts of life. That is the engineer’s high priviledge. The great liability of the engineer compared to men of other professions is that his works are out in the open where all can see them. His acts, step by step, are in ahrd substance. He cannot bury his mistakes in teh grave like the doctors. He cannot aruge them into thin air or blame the judge like the lawyers. He cannot, like the architects, cover his failures with trees and vines. He cannot, like the politicians, screen his shortcomings by blaming his opponents and hope that the people will forget. The engineer simply cannot deny that he did it. if his works do not work, he is damned. That is the phantasmagoria that haunts his nights and dogs his days. He comes form the job at the end of the day resolved to calculate it again. He wakes in the night in a cold sweat and puts something on paper that looks silly in the morning. All day he shivers at the thought of the bugs which will inevitably appear to jolt his smooth consummation. On the other hand, unlike the doctor his is not a life among the weak. Unlike the soldier, destruction is not his purpose. Unlike the lawyer, quarrels are not his daily bread. To the engineer falls the job of clothing the bare bones of science with life, comfort, and hope. 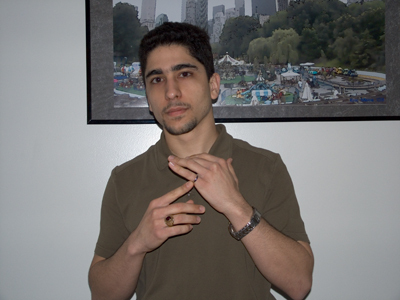 No doubt as years go by people forget which enigeer did it, even if they ever know. Or some politician puts his name on it. Or they credit it to some promoter who used other peoples money with which to finance it. But the engineer himself looks back at the unending stream of goodness that flows from his successes with satisfactions that few professions may know. And the verdict of his fellow professionals is all the accolade he wants.